In all the excitement of the Scuderia Flatpack V8olvo getting on its roof at Thunderhill we forgot all about their incredible new team logo! Just picture it: you head into the friendly blue-and-yellow warehouse store, shopping for a race car. Do you go for the Röttrï RX-7, or maybe the Chëëtüß E30? No, you want the Ford V8 in an intensely Swedish Volvo 240! Grab the flat-pack of the Swäpt V8olvo and put it on your heavy-duty shopping cart! 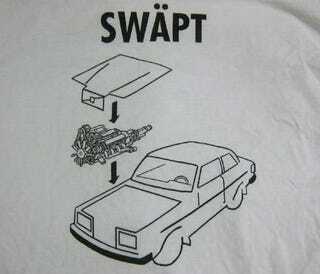 I'll be wearing my Swäpt T-shirt with great pride.